Welcome to the OctoCam OctoCopter Project Page! This project is currently under active development! This project is dedicated to building an economical, fully redundant, fully autonomous OctoCopter for light/medium/heavy lifting Arial Photography use, or just about anything else. I have long been interested in Arial Photography, but using a pod and boom model helicopter is rather complex and expensive. A multicopter presents an excellent platform and is relatively simple and efficient since there are no moving parts except for the motors & props themselves. 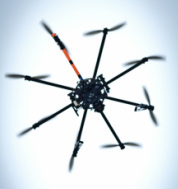 There are many types and sizes of multicopters, from 3 to 8 motors or more, and in various configurations. Beyond this, the platform can be customized as needed. So, you're wondering what's so special about my design? It's the combination of everything above, plus an enormous amount of R&D time and effort. Anyone can order parts and try building one of these on their own. The real expense and difficulty is the time and cost to investigate, prototype, test, crash, redesign, etc. Even if you have all the right parts to build your own, the skill and time it takes to properly assemble and make one of these flight ready for AP use is tremendous. Prop balancing, motor balancing, anti-vibration dampener configuration, wiring, Flight Controller configuration, etc., all take much time and trial and error. Add to that the weeks and sometimes months of delay waiting for parts and it's a lot of work! There are so many ways to "go wrong" that I couldn't even begin to document them all. When you factor all that in, a pre-tested and verified system looks very attractive at almost any price! Prototypes are being developed at this time. Once they are fully tested and operating to spec, they will be made into kits with various options and offered for sale. I have no firm ETA yet, but I'm trying to make them available by summer of 2013. Fully ready-to-fly packages will be offered soon. If you have a particular request, please let me know!